Remember that cute sprinkling of freckles you used to get every summer? No? Neither do I. Because when I spent too much time in the sun, my skin punished me — 20 years later — with an obstinate splotch smack in the middle of my cheekbone. I responded by getting it lasered off. Then another one rudely showed up the following year. Lasered that sucker, too. But as the years went by, the spots got bigger and multiplied exponentially. I was fighting a losing battle, and it wasn’t long before I was being matched to foundation colors like hazelnut and camel, instead of bisque and sand. So you can bet my head almost fell off from all that vigorous nodding when I read a study recently that found that dark spots are a bigger aging concern for Asian women than wrinkles. Lentigos, otherwise known as sun spots, are light brown to dark brown spots that develop on parts of the body that are more often exposed to the sun, including the face, chest and back of the hands. Many people refer to them as “liver spots,” but they have nothing to do with the liver. Instead, UV rays stimulate the skin’s pigment-producing cells to produce more melanin pigment. Freckles are small brown spots that most commonly occur on the face, especially across the nose and cheeks. They typically start in childhood, fade in the winter and typically get darker in the summer. Those with fair skin and hair and light eyes are more predisposed to getting them, though they are triggered by UV rays from the sun. Melasma produces dark patches on the cheeks, upper lip, forehead and/or eyebrows. It’s most common in women and can worsen during pregnancy or with birth control pills, so there is a hormonal component, although some men can get it as well. It often gets worse with sun exposure. Post-inflammatory hyperpigmentation occurs after the skin is injured, for example from acne, after surgery or from a scratch or bug bite. It can get worse with sun exposure. Thankfully, doctors and scientists in Asia have been studying hyperpigmentation for years. Their research has shown that some of the mainstays of anti-aging skin care, like retinoids and vitamin C, also are effective in battling hyperpigmentation. “Prescription retinoids such as Renova and tretinoin (Retin A) are the most effective,” says Dr. Wu, “especially when combined with hydroquinone.” Retinoids work “by interfering with the enzyme tyrosinase, which produces melanin pigment. It also increases skin cell turnover, so the dark patches slough off faster.” Of course, the downside of retinoids is that they may irritate skin and cause sun sensitivity, she adds. She also warns against using this ingredient when pregnant or nursing due to a potential risk of birth defects. 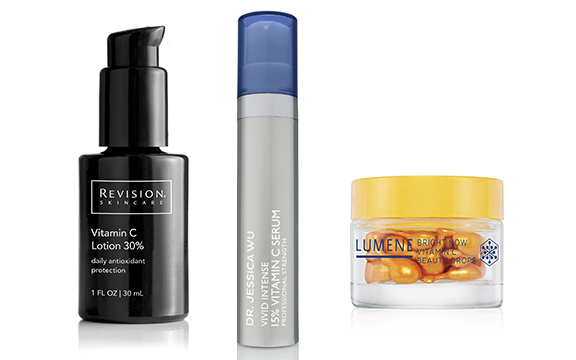 Vitamin C is another hero in the fight against dark spots. Like retinoids, the antioxidant inhibits tyrosinase, which interferes with melanin production. Vitamin C is tricky, though — it’s unstable when exposed to light or air, says Dr. Wu, so look for products in opaque, airless pumps, not open jars. Vitamin C also works best when paired with another agent such as soy, which interferes with a step in melanin production. Soy is good for those with sensitive skin, says Dr. Wu, since the ingredient is gentle and has anti-inflammatory effects. However, that makes soy less effective on stubborn spots that have been there for years. Inhibiting tyrosinase seems to be the method of choice, as other popular ingredients, including arbutin (about as effective as soy), kojic acid (derived from mushrooms) and azelaic acid (available in prescription strength), all interfere with the enzyme in some way or another. Scientists are looking at other potential spot lighteners as well, like tranexamic acid, which Dr. Wu says has been shown in small studies to reduce pigmentation and melasma by inhibiting plasmin, a substance that stimulates melanocytes, or the cells that produce melanin. The good news is that many of the ingredients that fight hyperpigmentation also happen to build collagen, fight free radicals and offer other anti-aging benefits. So lighten up with these power hitters. 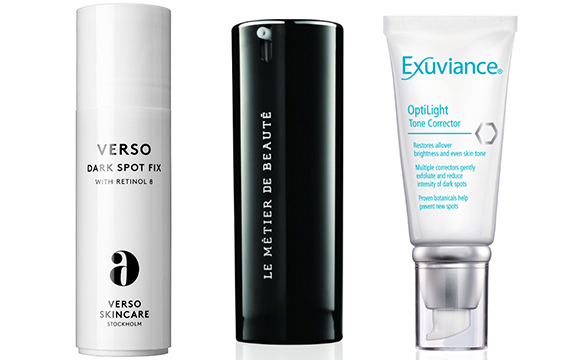 RETINOL: If prescription retinoids are too irritating to your skin, try gentler retinol. Verso Dark Spot Fix: With niacinamide and the highest dose of their exclusive retinol 8 complex, a stable vitamin A, this serum is safe enough to use during the day. Le Metier de Beauté Dark Spot Corrector: One percent retinol and 1% hexylresorcinol, a lightening active, are transported to the deepest layers of the skin using a patented delivery technology. Exuviance Optilight Tone Corrector: Patented NeoGlucosamine exfoliates and breaks up pigment, while retinol and vitamin C diminish existing spots. VITAMIN C: Make sure the product is in an airtight, opaque bottle since it degrades when exposed to light and air. Revision Vitamin C Lotion 30%: Recommended for sensitive skin, this treatment uses THD ascorbate, a stable and oil-soluble form of vitamin C developed in Japan. Dr. Jessica Wu Vivid Intense 15% Vitamin C Serum: Genius idea: This vitamin C serum is separated out into four small airless vials to prevent degradation. Lumene Bright Now Vitamin C Beauty Drops: Tiny, one-time use capsules slowly release vitamin C for maximum absorption in this 28-day regimen. ALPHA HYDROXY ACIDS: “AHAs encourage sloughing of dead skin cells and break up melanin in the top layers of skin,” says Dr. Wu. Therefore, this ingredient may be more effective for lighter, newer spots. Clarins Mission Perfection Serum: In addition to the cell turnover power of tamarind fruit acids, this new serum harnesses acerola extract to interfere with exosomes, the messenger that tells melanocytes to create melanin, and hexylresorcinol to reduce the appearance of dark spots. PEPTIDES & AMINO ACIDS: Meet the potential new power hitters in the fight against hyperpigmentation. DNAEGF Renewal DNA Regeneration Serum: Clinical studies found that this serum, created by dermatologist Ronald Moy, with its the high concentration of peptide growth factors, reduced irregular pigmentation and photo-damage in as little as eight weeks. 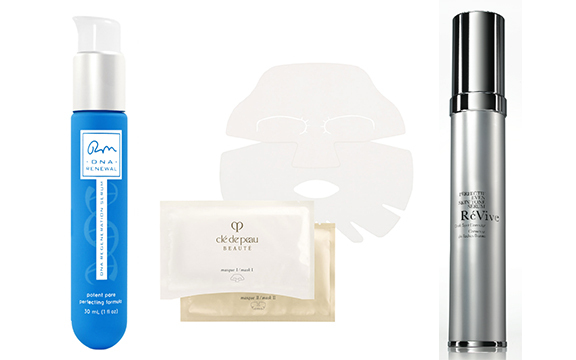 Clé de Peau Beauté Intensive Brightening Mask: Tranexamic acid, a synthetic amino acid originally used during surgery to prevent excess bleeding, was also found to prevent the formation of melanin. A 2014 study found that a topical application worked just as well as hydroquinone, with less side effects. RéVive Perfectif Even Skin Tone Serum: This serum, years in the making, features oligopeptide-68, a peptide that inhibits tyrosinase, and phenylethyl resorcinol, which reduces the appearance of dark spots. WHITE LINES: For stubborn spots, it takes a village — an entire line to address hyperpigmentation, from cleansing to night creams. Estée Lauder Crescent White Full Cycle Brightening line: This line arrived just in time, now that a new Yale study is out that found that damage caused by UV light during the day continues for hours after dark. The Crescent White line, formulated for and tested on Asian women, works with the skin’s circadian rhythms to fight damage day and night. La Prairie White Caviar Illuminating Moisturizing Cream: The Swiss skin care brand, known for its luxe ingredients like caviar and platinum, boasts a White Caviar line, which not only interrupts the cycle that creates age spots, it features a golden caviar extract with three times the omega-3 fatty acids of its other caviar collections. Other key ingredients include dioic acid (a hydroquinone alternative), tragranate licorice extract, sodium ascorbyl phosphate (a stable vitamin C) and a peptide to boost the lightening ingredients. 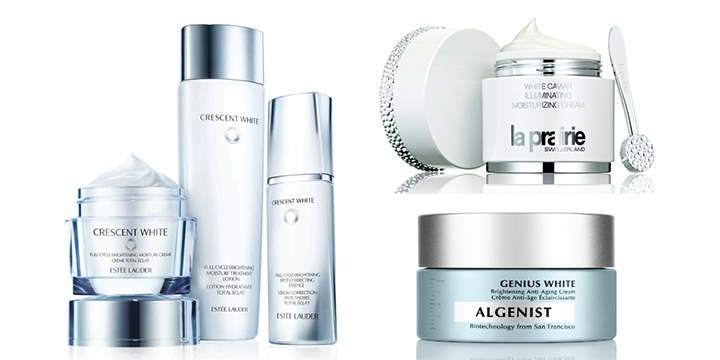 Algenist Genius White Brightening Anti-Aging Cream: Alguronic acid, niacinamide and a stable vitamin C work in synergy in this five-product collection. Adapted from “Brighter Days Ahead, Part I,” written by me and originally published in Audrey Magazine. It’s about time you started your own blog! I loved your articles on Audrey Magazine. I’ll be a regular fan/follower on this one.